Camping is quickly becoming one of my family's favorite outdoor activities! We love the fresh air, twinkling skies, and never-ending fun. Over the years and through much trial and error, I've developed a list of nine tips that make camping with kids fun and safe. Check them out before your next camping adventure. Set up a tent in your living room, backyard, or driveway and spend the night camping at home. I did this with my girls, and it gave them a better idea of what to expect when we went camping for real. Before your first overnight camping trip, visit a local campsite for the day. Check out the campground, hike the trails, and enjoy a picnic lunch as you familiarize your kids with the camping experience and help them feel comfortable with the campground. When you're ready to camp for real, ease into it. Plan a simple overnight visit to a local campground, and only pack absolute essentials. A successful first camping experience can lead to more successful and bigger trips in the future. There's no need to rush off hours away or pack everything, including the kitchen sink. Never wander away from the campsite or trail alone. Practice fire and grill safety. Don't touch or disturb wildlife. Check for ticks at least once a day. Wear insect repellant and sunscreen. Carry a whistle and use it if you get lost. Wash hands often, especially after playing in the dirt or using the bathroom and before eating. On one of our first camping adventures, we got soaked during an afternoon thunderstorm. I learned my lesson the hard way, and we always prepare for the weather now. Wear layers for protection during those chilly mornings and evenings around the campfire. Remember your rain gear, including rain coats and extra socks. Pack sunscreen and hats (for hiking or as you hang out at your campsite). Kids are more likely to get excited about camping and participate in the fun when they have a say in what you see, do, and eat. Before our camping trips, we gather as a family and discuss activities and the menu together. Part of camping is the adventure outdoors! 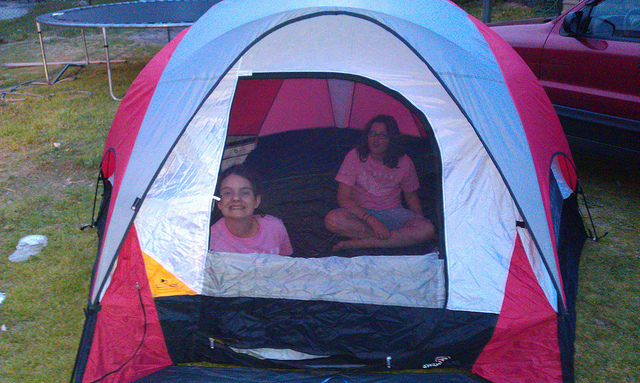 My girls love birding, hiking, and exploring around the campground, but we also pack a few fun toys. Here are our favorites. It's a good idea to pack lightly on your camping adventures, but I do recommend that kids bring at least one comfort item. They can use their favorite blankie, toy, or stuffed animal friend for comfort in case they feel anxious, scared, or overwhelmed on your adventure. Vacation is a time to get away from everyday life, but I notice that my girls function better, experience fewer meltdowns, and are more eager to play when we maintain their normal sleep and meal schedules. For the best camping experience, consider sticking to your kids' usual routine, too. When your family is ready to start camping, keep these nine tips in mind. They ensure your entire family enjoys the fresh air, twinkling skies, and plentiful activities on your camping adventure. What other tips would you recommend?